The holiday shopping season has begun. And to better compete with online retailers and attract more shoppers, Bloomingdale’s 59th Street flagship Manhattan store has re-imagined its customer experience, featuring a new pop-up store decked out with two massive 28-foot wide, 12-foot high video walls, each composed of thirty-five LG OLED Wallpaper 55-inch commercial displays in 7 x 5 configurations. The LG OLED video walls provide a dramatic digital backdrop for The Carousel, the upscale retailer’s new rotating pop-up shop. The Carousel offers an immersive shopping experience, where every two months, a notable guest curator and expert in a featured theme populates the space. The LG video walls are helping to bring the themes to life. The combination of unexpected product, unique shopping environment and exceptional customer engagement makes The Carousel like no other pop-up shop in the world. For this special project Bloomingdale’s chose Float4 for content creation. Float4 is a multidisciplinary studio that integrates digital experiences in physical spaces to amplify their identity. The content for the video walls will be rotated every two months to visualize the new theme. LG OLED has been acclaimed by experts as the pinnacle of picture quality. Because it uses self-lighting pixels and does not require a separate backlighting or edge lighting unit it is able to render perfect black, infinite contrast and intense colors, delivering an image quality that is not possible with any other display technology. The Carousel @ Bloomingdale’s will soon be transformed with a dedicated entrance located on 60th Street between 3rd and Lexington Avenue. 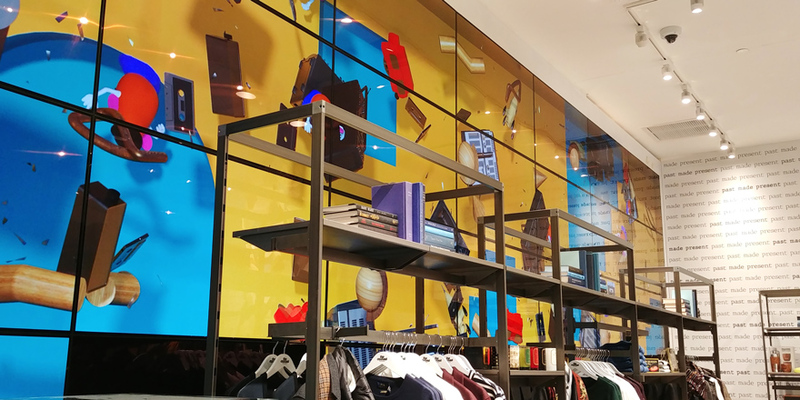 People will immediately take notice of the video walls, and we think that’s quite an exciting way to welcome shoppers, entice them to stay longer and keep them coming back. If you’ll be in Manhattan this holiday season, put The Carousel on your list of must-sees.